Snake wranglers Nick Banos and Leonardo Sanchez had a career-making catch during a hunt in the Florida Everglades on Saturday when they wrestled a 15-foot, 144-pound python into submission. The pair spotted the snake in the brush on the side of a levee where the trees meet the water. It quickly bolted into the bushes and trees when Sanchez jumped to grab it. After a few minutes, the hunters were able to take control of the python. One man grabbed the top of its neck, the other carried the tail. 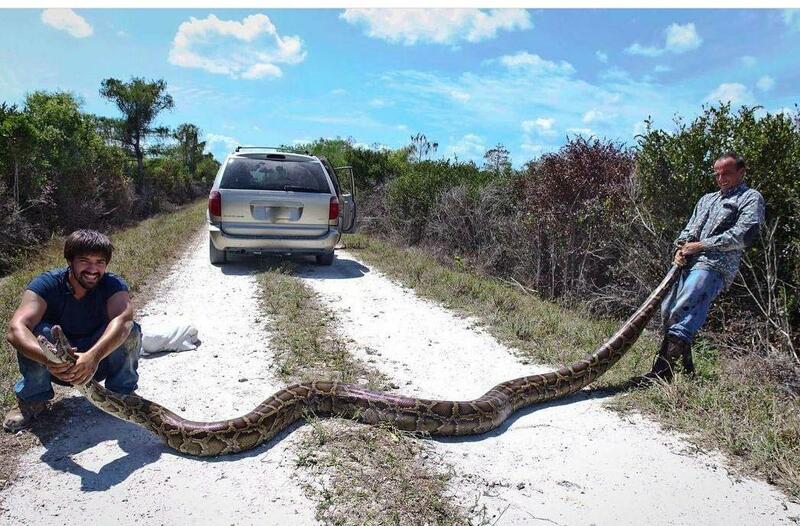 The men were working on behalf of the South Florida Water Management District, which created a pilot python elimination program to help protect the Everglades and eliminate invasive pythons from public lands. Every capture of a python 4 feet long or under is worth $50; every foot after that is an extra $25, Banos explained. Unfortunately, Banos says, the pythons have to be euthanized, which isn’t easy for most snake wranglers. Banos has been catching pythons for more than five years and says his experience has grown exponentially over that time, which is why he was one of 25 people chosen to participate in the unique python program. If you spot a python in your area, Banos recommends leaving it to the professionals. “With a snake of that size, if you don’t know what you’re doing the safest thing to do is call someone,” he advised.